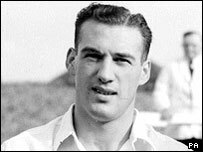 An 80th birthday party for Bolton Wanderers and England football legend Nat Lofthouse was being held on Thursday at the club's Reebok Stadium. Lofthouse, who received the OBE in 1994, played more than 500 times for his home town club and earned 33 caps for his country. A goal he scored against Austria in 1952 secured him the nickname "The Lion of Vienna". He joined the club aged 14 after working as a miner. Lofthouse's actual birthday is on Saturday, but this clashes with Wanderers away game at West Ham. Among those expected to attend the party are Sir Tom Finney, Sir Bobby Charlton, Roger Hunt and representatives from the Football Association and the Profesional Footballers' Association. The party is expected to begin at 2015 in the Platinum Suite of the Reebok Stadium, in Horwich.